Altered Five Blues Band became the first new artists to join the Blind Pig roster after the famed label was acquired by The Orchard, which is one of the world’s largest independent distributors. The band earned this slot via their heady mix of powerful modern blues, deep soul, and classic R&B, which has been steadily gaining them new fans over the past fifteen years and three critically acclaimed albums. Their recently released Blind Pig debut, and fourth effort overall, is Charmed & Dangerous, which should gain them even more accolades and fans. As on their previous release, 2014’s Cryin’ Mercy, Tom Hambridge is in the producer’s chair, but this time he also plays drums. The remainder of the band (Jeff Schroedl – guitar, Mark Sovleson – bass, Raymond Tevich – keyboards) is still in place, along with their dynamic singer Jeff Taylor, whose robust vocals fit the band’s musical blueprint like a glove. All 13 songs were written by Schroedl, with contributions from the band on several tracks. The title track opens the disc and it was a wonderful choice --- a smoking blues rocker with Taylor testifying to his manly ways and charms and Schroedl pulling out all the stops on guitar. “Mint Condition” settles back into a cool Texas-styled shuffle with Schroedl delivering again on guitar and Tevich providing smooth keyboard backing. “Three Forks” is a dazzling reworking of Robert Johnson’s “Crossroads Blues” with new lyrics that discuss going back to 1938 and saving Mr. Johnson from his eventual fate, and “On My List To Quit” cites a list of vices and dangerous habits that are best left behind. The mid-tempo “If Your Heart Went Public” has a Chicago feel, and Schroedl’s fretwork behind Taylor’s vocals is really sharp. “Gonna Lose My Lady” is a rocking boogie track that really swings, while “Cookin’ In My Kitchen” is an excellent slow blues that gives Schroedl and Tevich ample room to strut their stuff. The high energy “She’s Still Crazy” is a breakneck workout with Steve Cohen guesting on harmonica, and “Eighth Wonder” is a deep soul ballad with a sweet vocal from Taylor and backing vocals from guest Candice Smith. The surging blues rocker “Three Alarm Desire” picks up the pace, as Taylor’s vocal moves from a low rumble to a roar, and is followed by the funky “Small Talk” and the driving straight-ahead rocker “Rotten.” The disc closes with a low-key shuffle, “Look What You Made Me Do,” a fine way to end this superb recording. 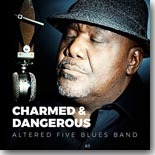 Charmed & Dangerous is Altered Five Blues Band’s best release to date. Taylor’s amazing vocals, Schroedl’s superlative guitar work, the rock-solid rhythm section, and the canny songwriting all but guarantee that you’ll be hearing a lot about this release when the end-of-year awards come rolling around.